Designed to law enforcement standards, the ASP Federal Handcuff Case is all leather, compact, allows quick and easy access to your chain or link cuffs. Each case has a spare key in a unique built-in slot on the back. 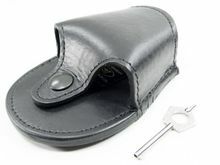 Pull through tab secures cuffs without inhibiting access. Snap closure. Snap Lock Back is adjustable to your belt size and allows removal of unit without undoing the belt. 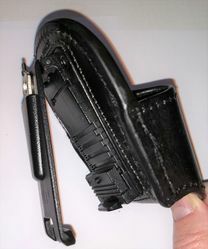 This holder is small and compact yet holds the ASP cuffs very nicely. The snap is just strong enough to stay snapped but lets the cuffs release easily. Basketweave Leather #53139 These models are for the ASP Chain or Hinged handcuffs.